News Items will be shown on publish only! Bluffton University students take part in various cross-cultural experiences domestically and across the world every year. Bluffton University’s 20th annual Alumni and Friends Golf Scramble will be held on Saturday, July 15 at Colonial Golfers Club in Harrod. The men’s soccer team at Bluffton University will host an ID Camp from 2 -4:30 p.m. on Saturday, June 17. The men’s and women’s soccer teams at Bluffton University will host a Soccer Day Camp Monday, June 12-Thursday, June 15. The Bluffton University women’s basketball team will host a Skills Camp Monday, June 26 through Thursday, June 29. The Bluffton University baseball team will host a Youth Skills Camp from 9 a.m.-3 p.m. on Monday, July 10 and Tuesday, July 11. The women’s soccer team at Bluffton University will host an ID Camp from 9 a.m.-noon on Saturday, June 17. The 2017 Bluffton University Ultimate Frisbee reunion will be held 3-6 p.m. June 24 on the Mussleman Library green. The Bluffton University volleyball team will host several skills camps in June. Bluffton University to host softball summer camps The Bluffton University softball team will host day camps for advanced and youth players. Bluffton University is offering a new degree-completion program starting in the fall of 2017. Bluffton University will present “Sondheim on Sondheim” as the May Day musical on May 5 and 6 . The engaging contemporary musical revue features both well-known and seldom heard songs of Stephen Sondheim. Bluffton University will celebrate its annual May Day weekend of festivities May 5-7. The traditional end-of-the-academic-year celebration intertwines the past, the present and the future. Bluffton University’s 2017 Spring Instrumental Concert will be held at 2:30 p.m. on Sunday, April 23 in Yoder Recital Hall. 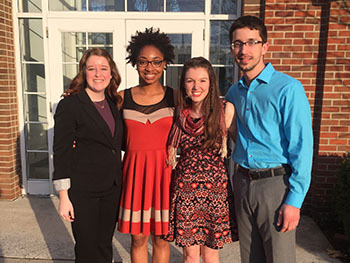 Claire Clay '18, a public relations major from Van Wert, Ohio, was named the winner of Bluffton University's annual C. Henry Smith Peace Oratorical Contest. Clay's speech shed light on the recent increase of violence on social media. An incoming student at Bluffton University has been awarded the university’s full-tuition Presidential Scholarship. An incoming student at Bluffton University has been awarded the university’s full-tuition Presidential Scholarship, valued at more than $110,000 for four years. Bluffton University will present “Sondheim on Sondheim,” a musical revue, for the May Day musical on May 5 and 6. Music education and history double major Aaron Johnson, of Goshen, Ind., will present his Bluffton University senior recital at 4:30 p.m. Saturday, April 8, in Yoder Recital Hall. Love is in the air during February and at Bluffton University, we are asking alumni and friends “What’s your #love4BlufftonU?” during the second year of this annual giving campaign. 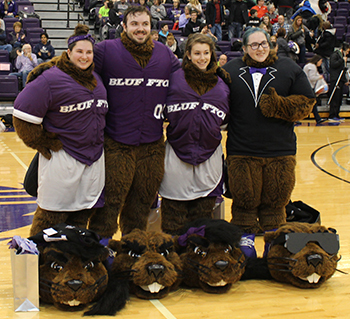 The students inside the beaver mascot suits are involved in multiple student clubs and athletic teams on campus. The students’ identities were revealed. Bluffton University will host its Holiday Concert featuring the concert band and several instrumental ensembles on Sunday, Nov. 20 in Yoder Recital Hall. Luz Varela is overworked, stressed and tired. But she’s also angry, and she wouldn’t have it any other way. Varela, a 2015 graduate of Bluffton University, is working as a legal assistant at the Refugee and Immigrant Center for Education and Legal Services. Members of the Bluffton University Social Work Club will go trick-or-canning during Bluffton’s trick-or-treat festivities, asking for donations of canned foods, dried foods and hygiene products. Julie Burstein gave insight into this year’s Civic Engagement theme Creativity, the Arts, and Civic Life. Burstein is the author of “Spark: How Creativity Works” which was the summer reading for first-year students. Bluffton University has named Adam Craig as head golf coach. Craig will be responsible for setting up the men’s and women’s program as well as recruiting during the 2016-17 academic year with team competition to begin the following year. Julie Burstein, a Peabody Award-winning radio producer, best-selling author and TED speaker will be the featured speaker at 10:45 a.m. on Tuesday, Aug. 30 in the Sommer Center for Health and Fitness Education, as Bluffton welcomes the class of 2020 at its annual opening convocation. Burstein’s book, “Spark: How Creativity Works,” was this year’s summer reading for first-year Bluffton University students. Bluffton University's Institute for Learning in Retirement (ILR), an educational program for retirees, is offering several courses beginning Jan. 18. Registration and course fees are due at the time of registration.